Belize : When and where to go? The warmth and humidity mark the climate of this small country all year round except in the Mayan mountains where temperatures are pleasant during the day and cool at night. There is a little less rain in the north, whereas it is very frequent in the tropical forests of the South. There is a high risk of hurricanes between August and October. The islands that dot the coast are refreshed by a tropical breeze that contrasts with the moisture of the continent. To visit the country pleasantly, prefer the dry season, between November and May, even if it is the most tourist season and the accommodation is more expensive. Belize is a tropical forest that opens onto the Caribbean Sea. Populated mainly by descendants of slaves from Jamaica (340,000 inhabitants), this country offers an astonishing mixture of African atmosphere and British culture (the official language is English). There are also many Mayan sites in the depths of its forest, a coastline of more than 250 kilometers, and many small islands, the cayes, along a sublime barrier reef where you can practice diving. You will be able to visit Belize City, which was the capital before being partly destroyed by hurricane Hattie in 1961, still full of colors and seduction in spite of its decrepitude: the courthouse, the governor's palace, Battlefield park, St John's Cathedral, the beautiful wooden houses in the north of the city, and the Victorian buildings of Fort Georges District are to be discovered. The small islands (or cayes) also offer the traveler beautiful surprises: the superb dive sites of Caye Caulker, the former fishing port of Ambergris Caye nowadays a tourist site as prized as relaxed, with many possibilities Of water sports, are two examples most appreciated by the visitors. Another must-see site is Lamanai in the New River Lagoon, within an archaeological reserve that you will reach by boat up the river, where you will discover Mayan remains dating from 1500 BC. A 34-meter-high building, surrounded by a jungle planted with luxuriant species and inhabited by howler monkeys. Another Mayan site, that of Xunantunich, overlooks a hill above the Mopan River, and this place, though invaded by vegetation, has a real wild beauty. Do not miss the Jaguar Reserve, founded in 1984, which hosts a spectacular local fauna of pumas and jaguars, ocelots and peccaries, boas constrictors and agoutis. Off Belize, accessible by boat, the Grand Trou Bleu, maritime curiosity made famous by the Commander Cousteau, with a diameter of more than 300 meters and a depth measured for 120 meters. In order to enter Belize, you must have a passport with 6 months minimum validity and a residence permit valid for one month and renewable for 30 days. Good to know: on departure, you have to pay an exit tax. 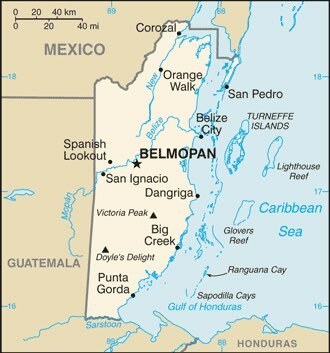 To get to Belize, you can take a plane from Miami, Los Angeles or Houston, but also from Guatemala. We landed north of the city of Belize at Philip Goldson Airport. You can also take the boat, and the road from Mexico. The current currency is the Belize dollar, but you can pay anywhere in US dollars (US $ 1 is worth $ 2 BZ). Budget: you will have to plan as a daily budget between a little less than a hundred euros, based on a double room at 50 € and meal at 10 € per person. There is no sanitary problem in this country, but some precautions should be taken if you spend some time in the jungle (protection from mosquitoes, drinking bottled water). For your travels in the country, the buses are very numerous and stop around, but do not be demanding on the comfort and the speed. You can also rent a car if you are over 25 years old. Boats transport you to the islands, there are several companies that provide these outboards. There are also domestic flights that make connections between the cays and the main cities of the country. A lot of cycling can also be done if you are careful. As for shopping, you can bring back handmade Indian fabrics, terracotta pottery, wooden masks.